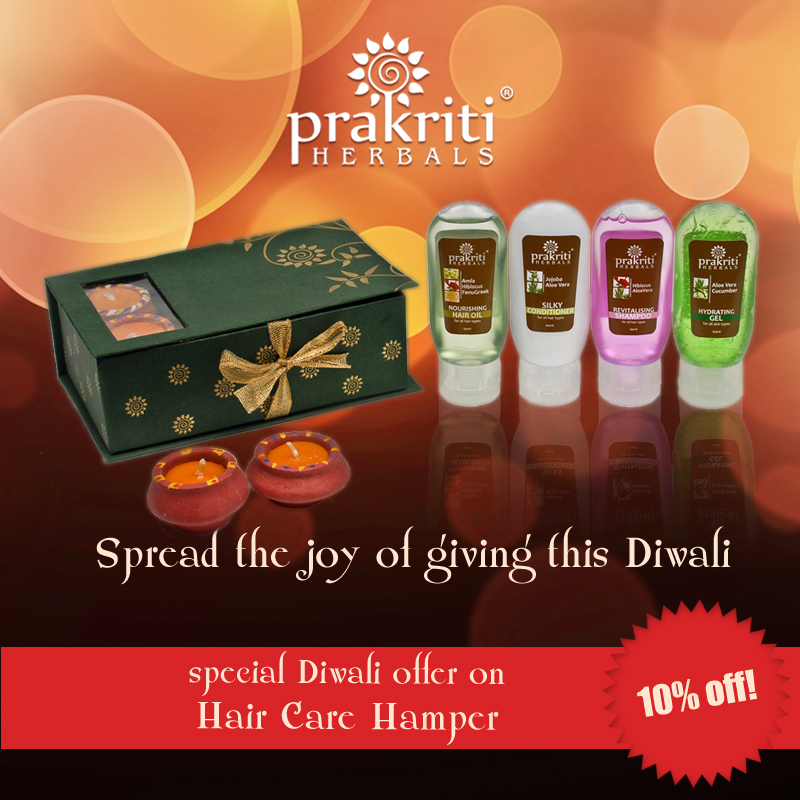 Does your skin feel tired & dull and hair feels dry & frizzy when you complete a long journey? Practice good habits while traveling to reach your destination refreshed and glowing! Here are some useful &easy beauty tips for you to follow when you travel. Even if it is a short flight we end up with visibly dull dry skin-drink lots of water to keep your skin hydrated. When you take a long flight, take off the makeup as soon as you start the journey. Carry wet type makeup removing wipes. You can spritz mist sprays like rose water all over the face. This will hydrate the skin and form a protective barrier against the dry air in the cabin. Carry a small moisturizer(30 ml) with you and reapply on the flight. For Haircare: Apply a small drop of your favorite hair oil in the palm of your hand and apply to the midshafts and ends. The air in planes is extremely dry and hair oil will provide moisture throughout the flight. When traveling to dry climates. If you are traveling to any dry areas like Rajasthan, Dubai, Abu Dhabi or even Egypt – your skin and hair need utmost attention. Traveling here can affect the skin and hair due to factors like humidity, dryness in the air, harsh Sunlight in these regions. Carry small bottles of gel-based cleansers or spritz toners, micellar based cosmetics, as it is travel-friendly. Lighter moisturizers can be used. Avoid thick, heavy creams. Try using natural products with aloe vera which moisturizes and helps to maintain a glow. Just as you would with your skin you need to put protection on your hair. Either with a hat, headscarf or some UV protecting spray, you’ll want to make sure it doesn’t overheat and burn. Tips to brave colder climates. If you’re zipping off to the Himalayas or vacationing in cold hilly areas there are some precautions that need to be taken. Surprisingly, the same factors that cause the skin to dry out in desert regions cause the skin to dry in cold regions. – You might be tempted to take bath in hot water but you should use lukewarm water. Hot water dries the skin and strips natural oils from the surface of the skin. 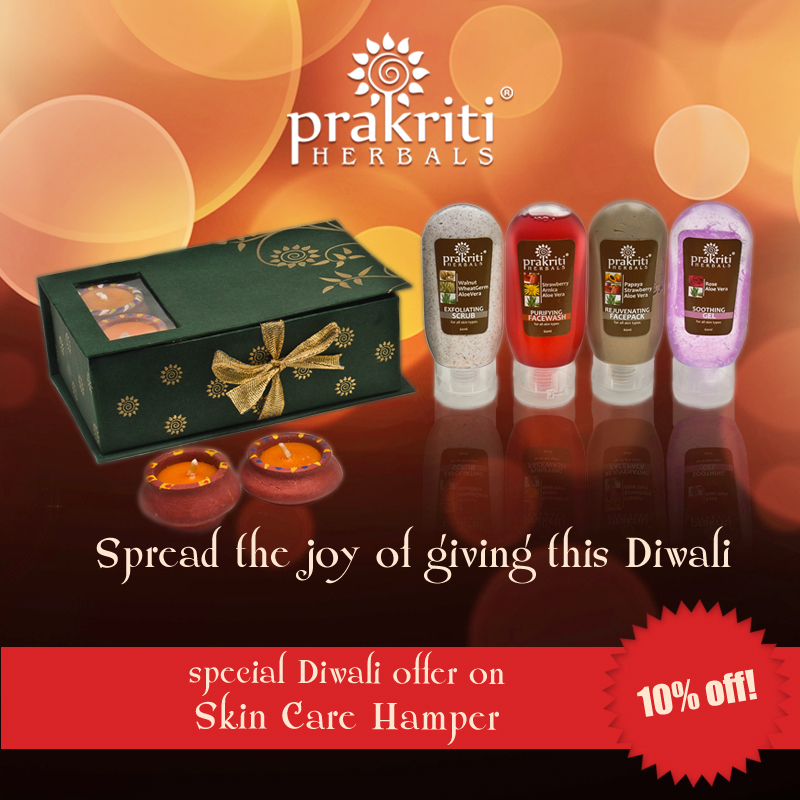 – For winter skin care, add a rich hydrating serum before applying the moisturizer or night cream. – Use lip balm rich in oils and moisturizing eye cream for the under eye region. – Apply aloe vera gel several times a day for 24 hours moisturizing. – Make sure you pack a small bottle of your preferred dry shampoo for hair care, which smoothens your hair. Have you ever experienced that disgusting smell sometimes when someone speaks to you? I felt it today morning when I met one of my friends and they wished me “Good Morning”. Seriously, it was a bad Morning…imagine what if you had bad breath & didn’t even know it or know what to do about it? Green tea is the solution to this irritating problem. Green tea freshens up our breath and also helps in lightening the teeth. Certain components in green tea destroy the cell membranes of the plaque bacteria which are also responsible for bad breath. Bad breath is caused by the same bacteria that also causes dental decay so your teeth will thank you as much as your friends. Green tea contains odor-neutralizing compounds called catechins, which act on mouth odor the same way antiperspirants do on body odor. For maximum effect, soak two green tea bags in warm water for five minutes, then gargle the tea around your mouth for 30 seconds. Just Feel the freshness now !! This yummy but healthy dessert is bursting with antioxidants and vitamins from carrot, mangoes and grapes to make your skin glow for sure &cool you down too in this sweltering summer!! The beauty of this dessert is that the components can even be enjoyed separately like the mango custard, and the carrot kheer &together they make for a mindblowing combination !! Filled with the goodness of beta carotene which is a powerful anti oxidant and Vitamin C,both potent anti aging agents-as well as the enzymes which do wonders for the skin-Mangoes &carrots are truly God’s gift to us!!! In a small bowl, mix the 2 tablespoons Custard Powder into the 1/2 cup of milk, stirring well until custard is completely dissolved; set aside.Place the mango chunks into a blender with 3/4 cup of milk. Puree for approximately 2 minutes. Pour the mango puree into a 1 1/2 quart saucepan and place on the stove on low heat. When the puree becomes warm, add the sugar and stir in well.Stir in the lime juice and then stir in the prepared Custard Powder mixture. Bring the mixture just to a near boil, stirring constantly, to completely dissolve the sugar. Stirring continually, bring the mixture back to a boil until it thickens. Allow to boil for approximately 30 to 60 seconds, still stirring constantly, and then remove the pan from the stove. Allow to cool for about 10 minutes, stirring every couple of minutes. Place the custard in the refrigerator for 4 to 5 hours to firm up. Take a pan and add little butter or ghee ,fry grated carrots,grind with milk(keep 1tbsp fried carrot for decorating) Boil milk,let it thicken ,add ground paste and cook for some time.Add roasted cashew nuts and dry grapes, switch off the gas. Once it is at room temperature ,store in the fridge. 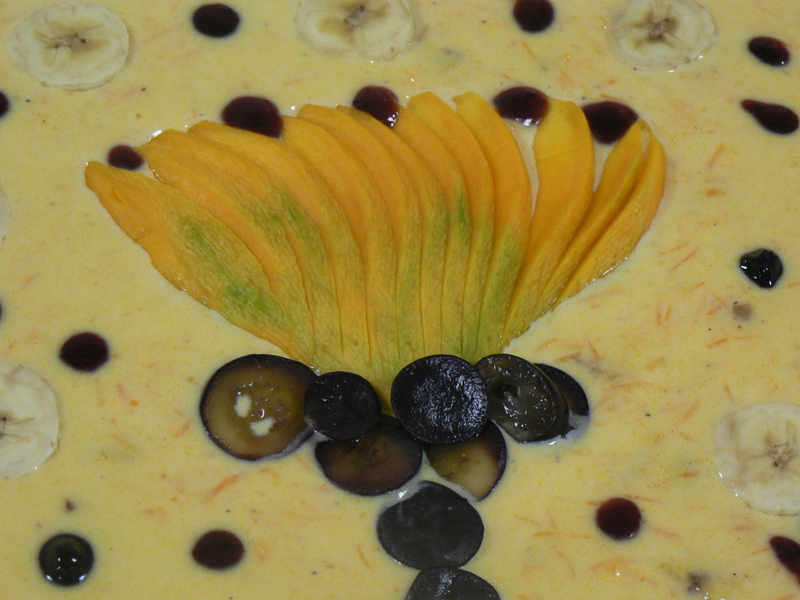 Put together the final mango carrot fruity dessert by mixing the mango custard, carrot keer,chopped mangoes,banana, chikoos,and grapes,vanilla essence and serving it chilled. to spread awareness and ensure that this inhuman behaviour and cruelty has to stop!! As a part of this movement, The Speak For Sasha Event will be held in Namma Bengaluru on the 29th of June . 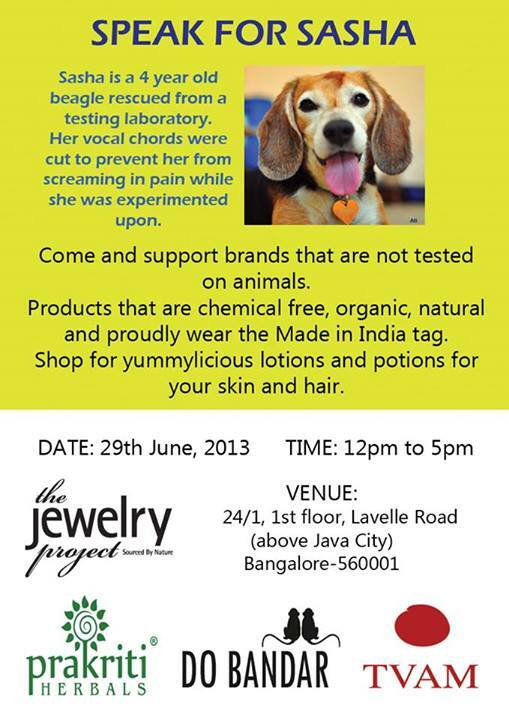 It will showcase brands that do not test on animals , or use harmful chemicals and proudly wear the Made in India Tag. 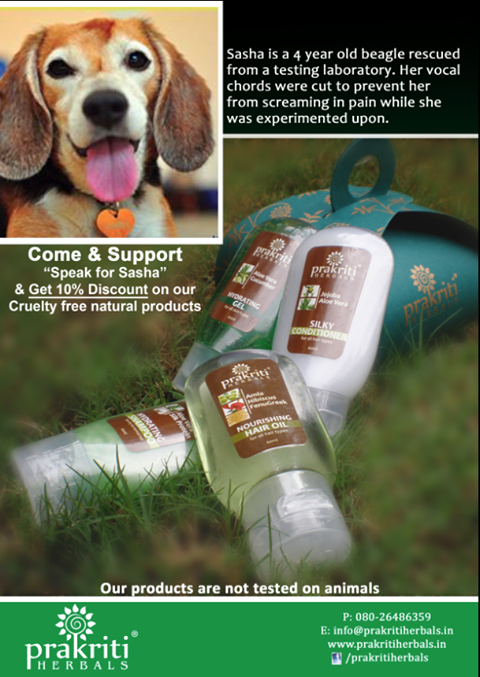 At Prakriti Herbals we are proud to be a brand which has never tested on animals and never will!!! Our natural products,which are free from harmful chemicals and naturally reduce hair loss, dandruff , frizziness ,acne, pigmentation, dark circles,eczema and other skin and hair problems will be showcased as part of the “Speak For Sasha” event. the guests who attend the event . So do show your support & attend the event ,and spread awareness about the campaign against cruelty to animals. CONTEST WINNER OF THE STRAWBERRY HEALTHY ORIGINAL RECIPE CONTEST!!! 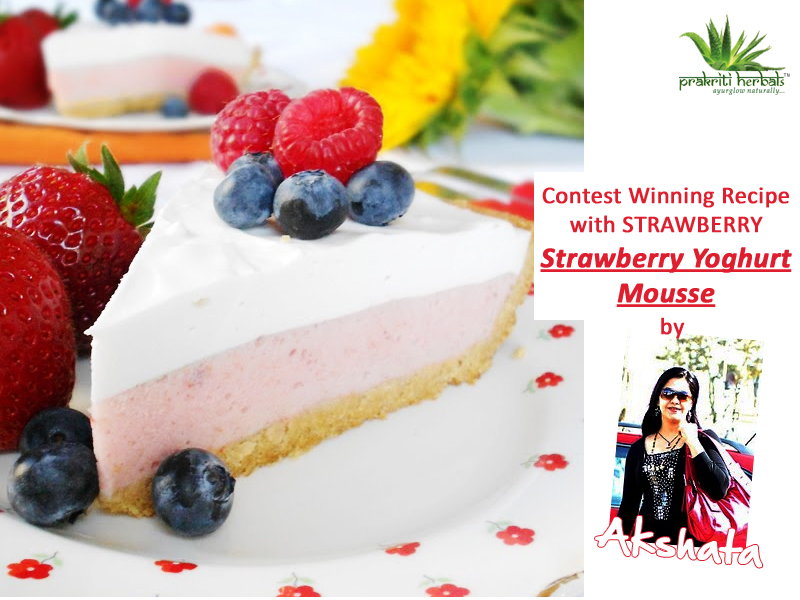 CONTEST WINNER OF THE STRAWBERRY ORIGINAL RECIPE CONTEST:STRAWBERRY YOGHURT MOUSSE PIE BY AKSHATA BHANDIWAD!!! Studio Brow loves to send out wholesome energy and vibe to our guests and friends who visit our locations. We thought we would share how folks can balance the body and mind using an ancient Eastern wellness belief based on seven energy centers that govern all bodily organs and work together as one system yet independently, according to the web site, Chakraenergy.com. A person can collect energy from several different levels of vibrations, including color, that are utilized in various parts of the body. Throughout the body, people have main energy centers, which are connected to major organs or glands that govern other body parts. 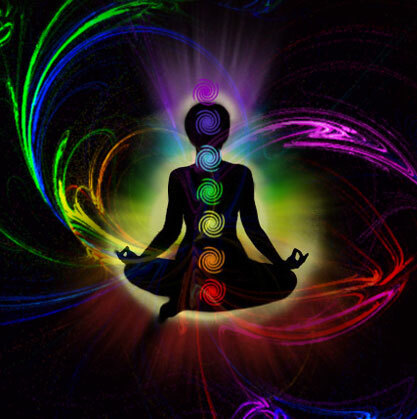 Each of these main energy centers are referred to as chakra – chakra is a Sanskrit word which means wheel.